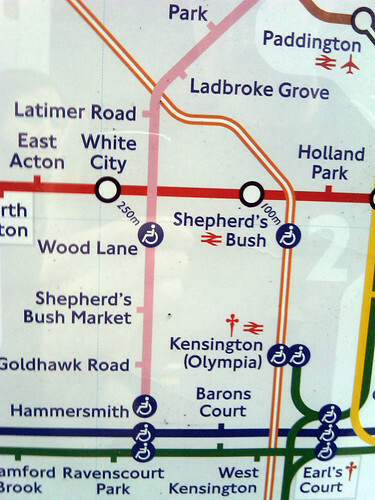 An October 2008 revision to the tube map adds a few distance markers to the map. It's 250m between White City on the Central line and Wood lane on the Hammersmith & City. And to the right, 100m between Shepherd's Bush Central line and overland. There's a similar thing at Canary Wharf Jubilee line: it's 200m from Canary Wharf DLR and 150m from Heron Quays DLR. I particularly like the angle they're drawn at - like an elegant version of the walklines I was trying out a long time ago. Previously: Tube Map with walklines showing when it's quicker to walk. See also Walk the Tube to get healthy, Walkers Tube Map and Adjacent stations. I'm not sure if I agree about West Hampstead's stations being better represented as a single node; there is a need to check out and in through ticket gates in order to make a change and the walk is not trivial, poorly sign posted and involving crossing a road. The situation is similar to that at Hammersmith the representation of which feels right to me.